Julius Caesar was a brilliant tactician and politician, who expanded the Roman Empire. He got greedy, though, when he declared himself dictator. As a result, members of the Roman Senate conspired and stabbed him in the back, both literally and figuratively. Julius Randle is a no-nonsense player who bullies defenders down low. Bull in a china shop is an apt description, especially since he’s 6′ 9″ and 250 pounds. After he spent the first four years of his career in Los Angeles, he took his talents to New Orleans and didn’t mess around. He was the same bull that he had been with the Lakers. Last night, though…. ….Julius did mess around, notching his sixth career triple-dub. In only 25 minutes! 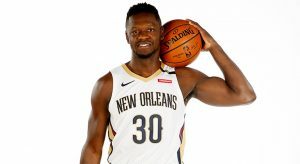 There’s been nothing but love for Julius in New Orleans, as he provides the team with a physical presence down low, who can also be a playmaker in the third-fastest team in the NBA for offensive pace. Ain’t nobody stabbing this Julius in the back. From a fantasy perspective, though, don’t go slicing and dicing your team to acquire his services. He’s a fine player, as he’s currently the 87th player according to Basketball Monster. The issues are the limited minutes, lack of threeecolas, low assists, and miniscule defensive contributions. Hopefully no one comes and stab me in the back now. Charley Murphy, Eddie Murphy’s brother, is probably a decent actor and comedian in his own right, but I am sure he understands exactly how the LA Clippers have always felt, living under the shadow of the vaunted Lakers purple and gold. 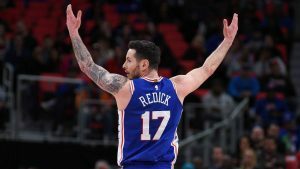 For a few seasons, though, the Clippers had the better record, a series of playoff finishes, the better nickname (Lob City), and a troika of stars that could not be matched in the other locker room. However, CP3 is now in Houston, DeAndre Jordan went to Dallas, and Blake Griffin is in Motown. Compound that with the fact that Lebron James wears purple and gold, and back to red-headed stepsister status go the Clippers. The Los Angeles Times is wasting barrels of ink on Lebron, his contingent of baby faced talents, and oddly matched veterans. The Clippers, though, are not completely bereft of talent, especially at the guard positions. A healthy season, which they are certainly due for, a little luck, and/or a Jimmy Butler trade could have the Clips fighting for a playoff slot. John Wall went from hero to zero back to hero in Washington this season. Nobody will argue that John Wall is the most talented player on the Wizards, but when he went down with a knee injury and the team started playing its best basketball of the season, people started questioning Wall’s value to the team. His selfish play was viewed as holding the team back in the day-and-age of the Hoosier method of at least three passes before a shot. The team’s hot streak wore off, however, and everyone started clamoring for Wall’s return. Now the Wizards are battling for a playoff spot and John Wall stepped up for one of his best games of the season: 4/29/7/13/3/3. I mean, wow, nice game and nice timing. Anyone still playing in fantasy who has John Wall is as excited about the timing of this as the city of Washington D.C. The MPAA (Motion Picture Association of America) film rating system has undergone numerous changes over the years. In 1968, there was G (general audiences), M (mature audiences), R (restricted), and X (under 16 not admitted). After a few years, the ages for R and X were raised from 16 to 17 years old. Then, a GP (parental guidance suggested) was added. That was subsequently changed to PG. Then PG-13 was added because of complaints about violence in certain PG movies. X was then changed to NC-17. Ai yai yai! My freaking head hurts. You know what wasn’t confusing? The performance from Paul George, aka PG-13, last night. A 40-burger on 73% shooting without one free throw attempt! Simply amazing. Anyways, since coming to OKC, the rebounds and assists are down, but the 3.1 3s on 7.4 attempts and 2.2 steals are career-highs! Don’t get hurt and looking forward to seeing you in Los Angeles next year, Paul. LA. Hollywood. MPAA. PG-13. It just fits too well.